Warm weather. Longer Days. Early Sunrises. Time to get up and not just see it, but to be with it. It’s time to brush off the cobwebs of winter and get into the great outdoors! A great way to do that is to take your practice outside. There is no better yoga mat than Mother Earth. Earth. Water. Fire. Air. Space. Earth’s energy is grounding and stabilizing. Water’s energy reminds us to be fluid and creative. Fire’s energy helps us to burn through the impurities and toxins. Air’s energy is light and airy. Space reminds us of the vastness within us and all around us. When we practice outdoors we can breathe them all in and embrace the beauty of nature. An opportunity to tune all our senses into the rhythms of Mother Nature. Taste. Smell. Hear. See. Touch. Nature’s beauty abounds and seeps into all of our senses when we begin to pay attention. Taste the salt air. Smell the tide. Hear the constant rhythm of the ocean waves rolling in and out. Tune in to the sounds of the birds. Touch the earth on your hands and feet. Primordial Sounds! Birds chirping, waves crashing, leaves blowing. Wow! So beautiful! Inversions are ommazing outside! The earth is up and the sky is down! Talk about seeing things in a new way! You live in the PERFECT place to take your practice outdoors, and this summer we have several opportunities for you! Occassionally the weather interferes, so please like us on Facebook and check the schedule page on our website before heading out in case of cancellations due to weather. Sorry for the confusion – all outdoor classes ended at the end of August. We hope to see you in the studio! I should be more specific. I was referring to the beach yoga. 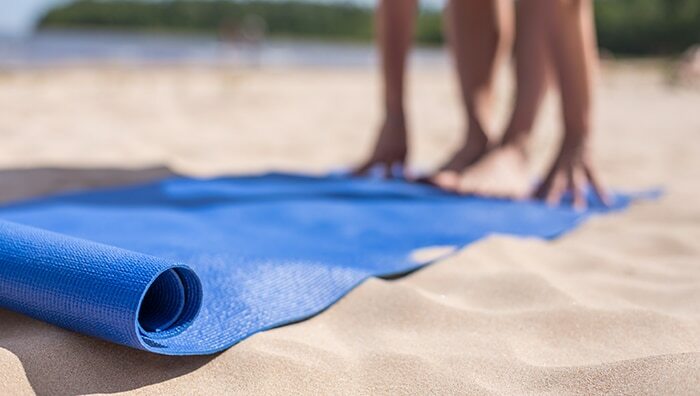 Outdoor yoga classes begin on May 15th. Please feel free to check back, follow our facebook page for updates, or sign up for our newsletter to receive updates!